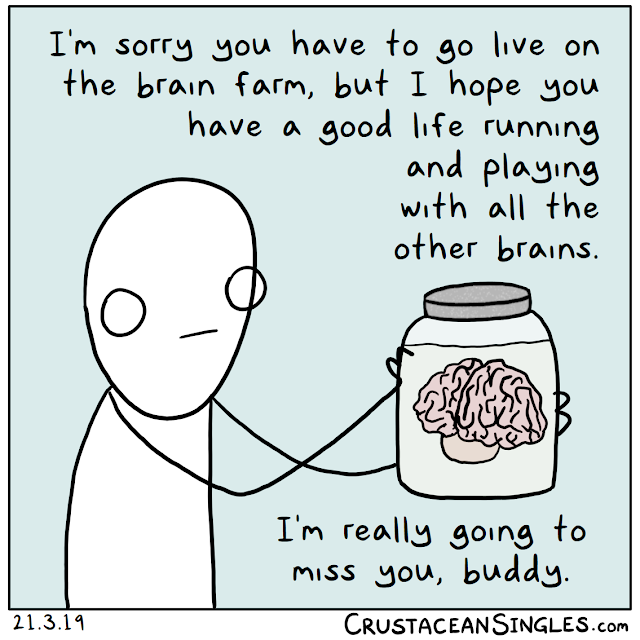 The day before yesterday, I posted a comic about a person's brain not letting them sleep. That was inspired by a story that is all too real. Yesterday I inadvertently demonstrated just how harmful the lack of sleep is (plus chronic pain and bunch of other health stuff) by 1) struggling to think the word 'equinox' and not immediately type 'solstice' (which I managed to fix before too many people saw my mistake) and 2) thinking "11,000 years ago" as a rough approximation of when some ancient people were making giant stone circles...and then typing "eleven centuries ago", which I didn't realize until the middle of the night was off by a zero. It's frustrating being chronically ill in both body and brain. For most of my life, I've done most of my living inside my own head. Knowledge—especially obscure knowledge—has always been one of my favorite things. But the past few years have forced me to slowly start coming to terms with the sad fact that my own cognitive capacity is no longer reliable from day to day or hour to hour. It's a slow process. It's grieving on an installment plan. I have no intention of stopping my years-long streak of daily comics until I absolutely cannot continue. But just...please know that the terrain I'm navigating is hazardous and unfamiliar, the pitfalls nearly invisible. Don't stop pointing out errors when I make them, please! I believe more than ever that it is better to be corrected than to falsely feel correct. Just please also be patient with me as I'm also learning to be patient with myself.